Topped by a tower with 360 degree views over the sea and over stunning Cornish countryside, Orchard Cottage really is a dream come true for those who need a total break from town living. Orchard Cottage is well equipped, cosy, delightfully higgledy piggledy and well positioned for many of the main attractions in Cornwall. Week beginning 22nd June 2019: Please note that the access lane to the property is being resurfaced between 22nd & 29th June. However, the local farmer is making it possible to drive through his fields and park about 200m away from the cottage. But this would only be suitable for guests with 4-wheel drive cars. Ground Floor: Open plan dining area and sitting room area. Kitchen with doors to the garden and hallway with part galleried staircase to first floor level. First Floor: Master bedroom with 4'6" bed and twin room with 3' beds. Both rooms have sea views. Separate bathroom with over bath shower and additional cloakroom with WC. Further staircase leading to second floor level. 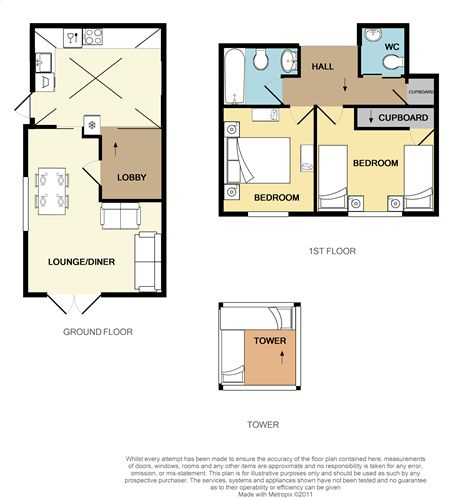 Second Floor: A tower room with incredible 360 degree views over surrounding area with built in bench seating which can provide beds for two children if required. Amazing sea views towards Mousehole of St Michaels Mount. Exterior: A courtyard style garden with verandah and path leading to a good sized lawn. There is external furniture. Heating is via central heating & night storage heaters. The kitchen has a range of equipment. There is an electric oven and hob, a microwave, toaster, kettle, fridge / freezer, dishwasher & washing machine. The sitting room area has a flatscreen digital FreeviewTV & DVD player, CD & Radio. There is WiFi available at the property. There is an iron & ironing board. Electricity, heating, bed linen & towels are all included but you will need to provide your own beach towels. Parking facilities for up to 2 vehicles. Regrettably no smoking or dogs are allowed. There is a cot & high chair available. Week beginning 22nd June 2019: Please note that the access lane to the property is being resurfaced between 22nd & 29th June. However, the local farmer is making it possible to drive through his fields and park about 200m away from the cottage. But this would only be suitable for guests with 4-wheel drive cars. Only 9 minutes from the attractive old town of Marazion, which is a popular destination for beach holidays. The town is most famous because of the island and castle of St Michael's Mount, which is still lived in by the St Aubyn family. The island can be accessed at low tide by the causeway or by ferry at high tide. The tower and battlements of the castle stand 230 feet above sea level, and the island hosts a harbour, shops and restaurant. Mounts Bay is absolutely stunning and offers clean sandy beaches and safe bathing. A short distance along the coast is Perranuthnoe which boasts the oldest inn in Cornwall. It also has a wonderful sheltered beach which is popular with families. Penzance is just a 15 minute drive away. Every June, Penzance holds the Golowan (Feast of St John) & Mazey Day celebrations. This week long celebration attracts many visitors and traffic is banished from the centre of Penzance during Mazey Day when the streets become lined with stalls and hold colourful processions. From Penzance harbour you can catch a ferry to the Isles of Scilly or travel to the islands via helicopter from Lands End. The sub tropical gardens of Morrab are definitely worth visiting. Guest from Crawley stayed for 7 nights. We had an excellent week's holiday In Orchard Cottage and we are already looking forward to returning there next year. The sea views were fabulous and there was always a great sense of calm and tranquility, and of being close to the power and magic of nature. The 360 degree tower became a matter of which of us could get up there first on arriving back each evening, such were its magnificent views, including of St Michael's Mount - in fact all four of us fitted easily on to the bed-seats in the tower. Our satnav initially took us down a wrong bumpy path, but a phone call to Jane, the owner, soon got us to the cottage. A superb holiday. Guest from Cockermouth stayed for 7 nights. Excellent location in a beautiful quiet area made for great views over St Michael's mount, Penzance and Newlyn and we were never more than 15mins drive away from the big attractions western Cornwall has to offer. The owners made us feel very welcome and even provided the kids with costumes for a fancy dress day in Penzance. Thanks again for the lovely Holiday. Guest from Vleuten stayed for 3 nights. Guest from Mansfield stayed for 7 nights. Back from our second visit to this lovely cottage! It's in a very remote location accessed by a typically Cornish single track road which is a little bumpy! The cottage itself has stunning views of St Michael's Mount and is very quiet and peaceful. The owner, Jane, cannot do enough to help. Would definitely recommend this cottage and will be making (another!) return visit in the future. Guest from Epsom stayed for 7 nights. This was a return visit for us, as we had such a great time three years ago. The location is unbeatable - remote enough to be utterly peaceful, but with absolutely lots to do for families, well within half an hour's drive - and we had another lovely week. The highlight, once again, was being able to spend all our evenings up in the 'lookout tower', watching the sun go down, the lighthouses and buoys light up, and all the activity in Mount's Bay. We spent a wonderful week at Orchard cottage, it was very clean and well equipped. Our 2 children enjoyed the tower and there was plenty of things to see and do within a short drive of the property. We hope to return in the future. Guest from Rotkreuz stayed for 14 nights. Great, very quiet house amid wonderful nature and with a fantastic view. We especially enjoyed the tower and its 360 degree views. A lovely spot for relaxing and winding down. Within a few minutes walk we were at 'our' beach and enjoyed the rockpools and climbing over all the rockformations. The owners next door are extremely friendly and helpful if required. Important to mention in the description: The last part (about half a mile) of the road is in a pretty bad state with lots of holes in the surface. Driving at walking speed necessary. A fantastic week. Lovely cottage, very well equipped and very clean. Excellent location with fantastic views. The road to the cottage is quite difficult at first, but really not a problem. The owner of the cottage was very welcoming on arrival. Nice to have the owner available for any questions / problems whilst at the same time just leaving us to it. I would recommend this to a family with teenagers who would love to escape to the tower - ours did!! A very relaxing week, just what we had hoped for. A lovely cottage which was immaculately clean throughout on arrival. The kids were most excited about the tower and it didn't disappoint! That was their hideaway for the week. Stunning sea views from the bedrooms as well as the tower. The owners were very friendly and helpful, a lovely couple. The final part of the drive to access the property is narrow and bumpy but this wouldn't put me off another visit. In fact I'd go again tomorrow!! we had a lovely stay here and the views were spectular. the children had fun staying up in the lookout. Mrs Smith was very helpful and told us about the lovely Stackhouse cove which we visited on our last day. The cottage is well placed to get to Penzance St Ives Lands End St Micheals Mount and many more. would definately recommend a visit. so peaceful and quiet. Guest from Kingston Upon Thames stayed for 7 nights. We had a wonderful stay in Orchard Cottage. Jane was very helpful and the cottage contained everything we could have wanted, including some lovely jigsaws, perfect for relaxing after exploring the stunning coastline and coves right next to the cottage. Guest from Stanton Under Bardon stayed for 7 nights. Friendly owner and a great location for visits to surrounding area. Great walk to nearby village with lovely coastal views and food. The views from the room on the top floor are 360 degrees and amazing. I would stay here again. The pictures of this cottage do not do it justice! It is a perfect little cottage for the price point and we had a wonderful week's holiday there. The location is just ideal: quiet and secluded with wonderful sea views, moments from the coastal path, walking distance to a lovely beach (probably not if you have very young children) and close enough to supermarkets, a farm shop, a chippy and everything else you might need. We were hugely impressed with the kitchen's provisions - lots of pots, pans, knives that could actually cut something (so many holiday homes have ones blunt as anything!) and so on. The 'look-out' room as we christened it was a wonderful space for our boys to chill out in and there are loads of board games, jigsaws, books and so on for the inevitable rainy days! For the days that aren't, the garden was a wonderful space to have a few sun-downers in the evening. For those with young children there are plenty of provisions - stair gates, etc - it's obvious that the owners have young grandchildren! My only slight critiques would be: lack of BBQ and not enough drawer-space for unpacking. But neither would stop us from re-booking this property. We left with a very heavy heart! We enjoyed the panoramic views of St Michaels Mount and Stackhouse Cove every morning and evening. Our family loved exploring the coast at the bottom of the fields. The cottage was peaceful and well equipped and a great location for exploring Cornwall. We all (mum, dad, boys of 9 and 5) absolutely loved staying at Orchard Cottage and would love to return. Owners were really friendly and helpful, very quickly sorting out our initial problems connecting to wifi, and even getting in our washing when it unexpectedly rained while we were out! Lovely comfortable house, with everything we needed, in superb utterly peaceful location - loved listening in bed to the sea. Views from the lookout tower were even better than we expected, and really comfy seats up there, perfect for watching sunset, night fishermen, lighthouses etc with a glass of wine ot two - parents didn't watch any TV all week. Lots of books & videos provided. Short drive (or a fair walk) to St Michael's Mount. Great walks along the SW coastal path. Wonderful, wonderful beach less than 10 minutes' walk (down a slightly brambly offshoot from the coast path) from the front door - great swimming, floating/snorkelling, sandcastle building, rockpool exploring, shell hunting, frisbee throwing etc and rarely another person in sight. Pretty handy too for Flambards if you like pleasant low-key but entertaining theme parks, and easy days out on the Lizard. Orchard Cottage was a fabulous find, it's a beautiful cottage and we had our own section of the lovely garden with free use of any herbs for cooking. Views of the sea are amazing (as are the sunsets from the tower). It is so peaceful there. The owners couldn't have been more friendly or helpful. If I go back for a holiday to that area of Cornwall I will definitely book Orchard Cottage again. Please note that this is a nearby location as Google Streetview does not show Orchard Cottage.